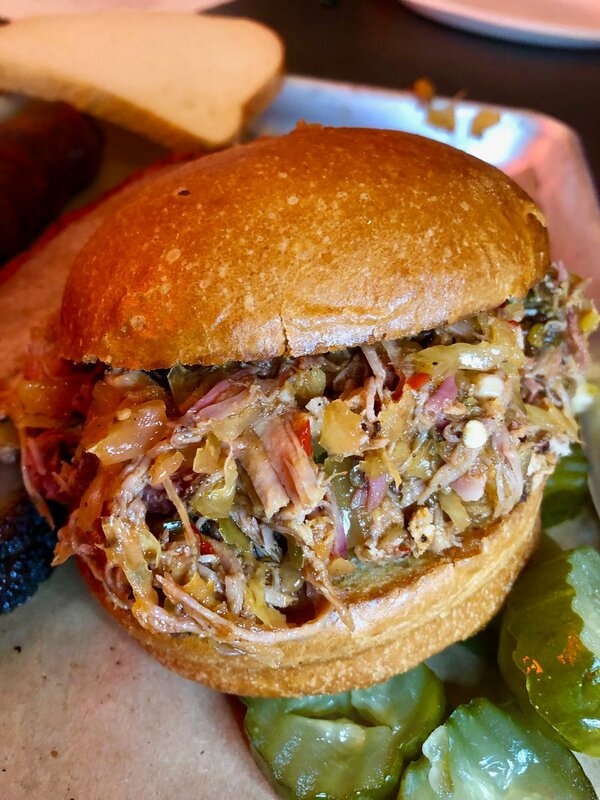 Las Vegas is where barbecue goes to die. If I’ve said these words once, I’ve said them a thousand times. Great ‘cue has come and gone over the years. From Struttin’ Gates to Paul Kirk’s R.U.B. to Salt Lick to Little Joe’s at Plant World (remember him? ), all the good ones barely make it two years in Vegas before picking up stakes and heading back where they came from. (Kansas City, Kansas City, and Driftwood, Texas if you’re interested.) As far as we know, Little Joe departed for that great red neck smoker in the sky years ago. Because of the failures of actual, pit-cooked, smokehouse barbecue, the real, smokey deal has been harder to find around here than a pork chop in an ashram. 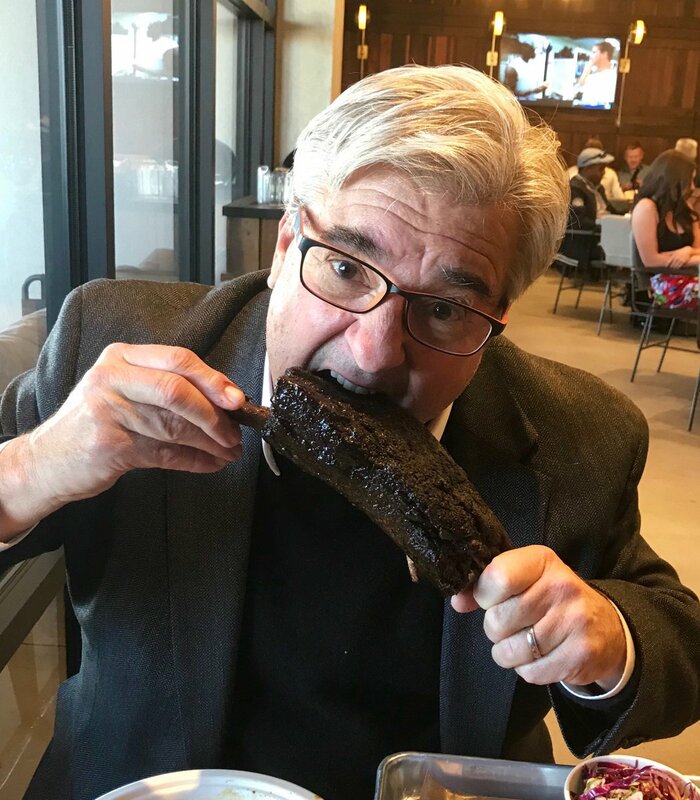 And because mediocrity in all forms sells in these here parts (Guy Fieri, Giada, Donny and Marie…) set-it-and-forget-it has become the watchword of all of our barbecue restaurants. Why bother trying to do something good, the thinking goes, if your customers can’t tell the difference? But things they be a’changin’. 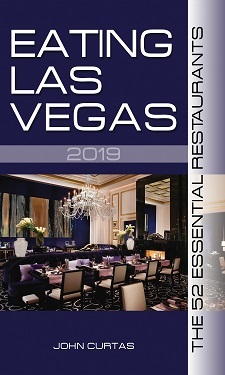 First out Green Valley way with Sin City Smokers, and more recently with Michael Symon’s Mabel’s. Steve Overlay’s Sin City Smokers has been around for a while, and the only thing I can find wrong with it is that it’s too far from my house. His ultra-long smoke times produce a beautiful bark, and spoon-tender brisket ($9) that is dense and moist — whether you’re biting into a lean or fatty cut. No mean feat that. Speaking of brisket, Valley Cheese and Wine proprietor Bob Howald sprinkled the finishing salt you see on the cuts above. He told me he always does it with brisket and he was right: the little flakes of sodium chloride really bring out the beefiness (and smoke) in the meat. Try it sometime. Symon (pictured at the top of the page) is a well-known celebrity chef from Cleveland. (Full disclosure: I once judged him on an episode of Iron Chef America. He won, if memory serves.) 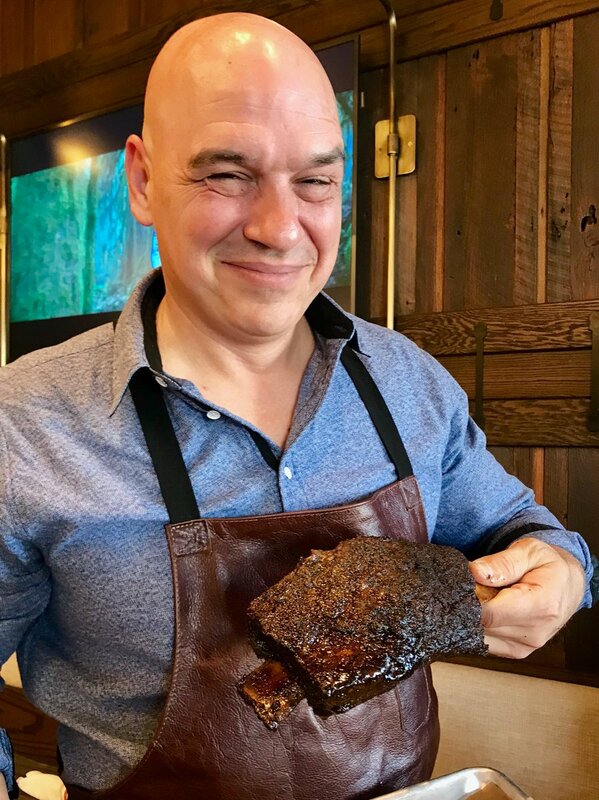 As a Greek-Sicilian, you might presume that he has as much business doing barbecue as dim sum, but like all accomplished chefs (and Overlay, for that matter, who also did some serious work in professional kitchens), when he sets his mind to cooking something, he does it right. And I’m here to tell you: Mabel’s has got it right. The brisket is straight outta Austin. More particularly, I’d hold it up to the stuff being done around Lexington, Texas like Snow’s or Louis Mueller). 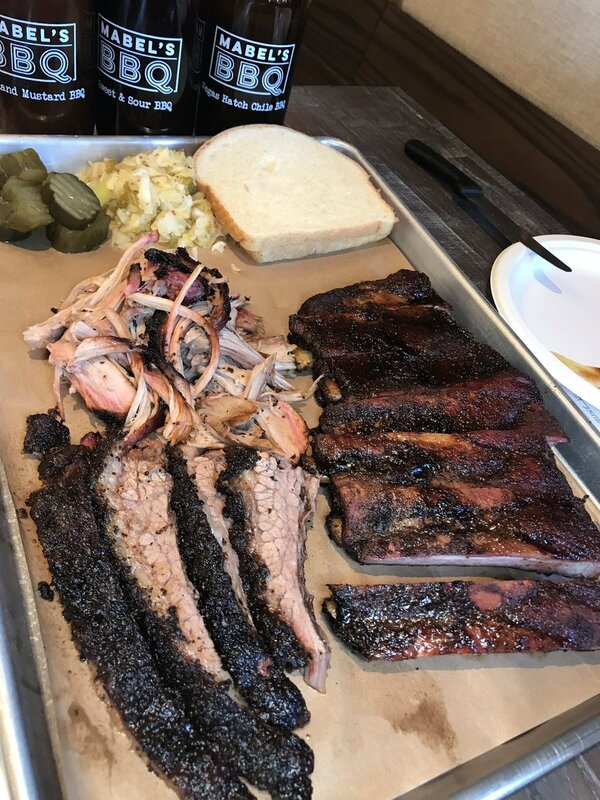 As good as the brisket is, it is the brontosaurian beef rib — straight from Black’s in Lockhart — that will get your attention. Keeping the Texas vernacular going, Symon’s hot links have that snap, bite and serious heat you rarely find outside of the Lone Star State. And then there is that beef rib ($50). Coated with “pastrami spices”, it is 2+ pounds of pure, unadulterated beefy bliss. According to the menu, it’s enough for 2+ hungry adults. Realistically, it’ll feed four. When I got done with it, there was plenty more on the platter to tackle, including some righteous ribs, truly sour kraut, house made pickles, and cheddar-jalapeno hot links that take no prisoners. 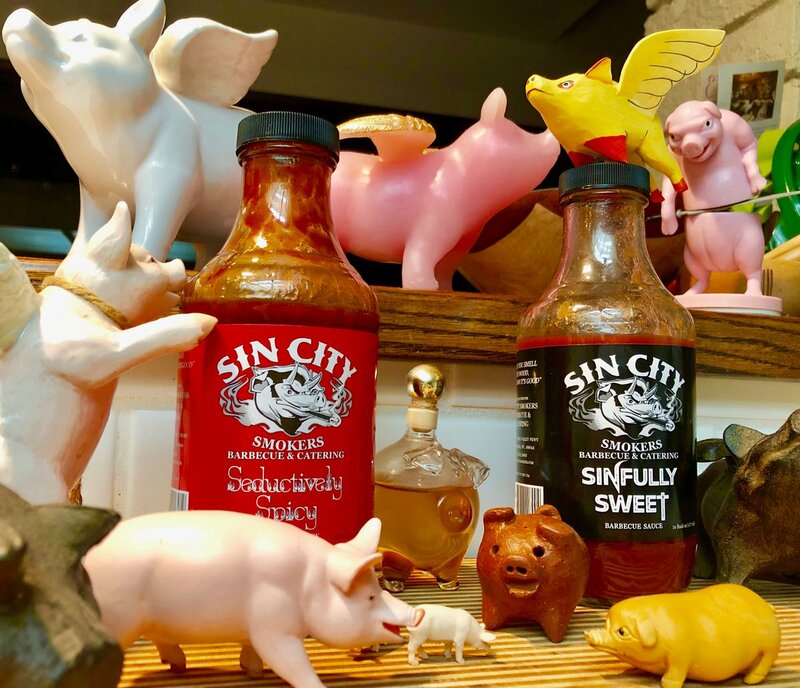 Put it all together and you have the most complete barbecue restaurant to come to town since Salt Lick threw in the towel ten years ago at the Red Rock Resort. As for sides, I barely pay attention when the meat is this good, but Mabel’s does a killer poppyseed slaw and Sin City does a super-filling “Five cheese smack-a-roni” of uncommon cheesiness. Desserts at both are minimal and forgettable, but who cares when things are this smokin’? Sin City and Mabel’s are the first places in a long time where I can firmly and happily advise to park the pork and bring on the brisket. Just like they do in Texas. CHINA MAMA is Back, Baby!